After a Thanksgiving roast, complete with pumpkin pie, Simon and I took a walk into dowtown and and across the bridge into Prince’s Island Park. 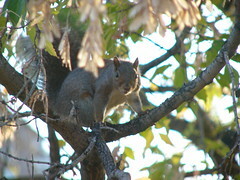 This little critter has plenty of friends, with a number of squirrels scurrying across the pathway clasping their nuts. It was a pleasent afternoon but with the temp. dropping to about 5 degrees we were both keen to get home for a cup of coffee and another piece of pie. Hi Gemma! It’s your Calgary buddy. For those of you who don’t know me, I work at Chintz & Company with Gemma. I think that your blog is great. It’s lots of fun. The picture of the lighting storm was fantastic. I love lighting and we get some great storms here. I agree that some chocolates we have are not the greatest but North American’s seem to like there chocolate milky and sweet. It’s like the Lemon Raspberry Kool-Aid, sweet artificially flavored water. But kids really like it. I told you I would make a post and now I have. Keep up the great work. Maybe I should start a blog. My sources indicate that you will soon be relocating to Toronto, which as we all know is the birthplace of the uncontestably great Neil Young. But Neil spent most of his childhood with his mother in Winnipeg, following his parent’s divorce. It’s kudos time again. Which song would Neil play over and over again on a jukebox in a Falcon Lake restaurant (near Winnipeg) as a teenager? He’s described it as the most beautiful song he had ever heard. And there’s a link to the province in which you currently reside. Ah ha! this one was a bit tougher but after some serious research I have it – Ian Tyson’s “Four Strong Winds”. ‘Inspired by the seasonal movement of workers around the country, from one harvest to the next, and the effect of such transiency on a love affair, it was written ca 1961’. If it seems familar to some that is because Australia’s very own “The Seekers” released a cover of this song, along with many others. Downloading a copy, will let you all know what I think. Next Next post: It's snowing!